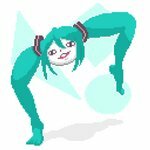 Fucked-up version of Hatsune Miku's head with twintails for legs (or is it legs for twintails?). The meme originated with post #674465 by puzzle157xxx. Adding what to any image of this creature is understandable, but you probably shouldn't overdo it. The following tags are aliased to this tag: shiteyanyo (learn more).